Chris - For thousands of years, people have been studying and documenting human anatomy. In these days, we do it to turn out well-trained physicians and surgeons. Students traditionally use bodies donated for dissections as well as prosections which are expertly prepared specimens that reveal the important structures they need to know about. 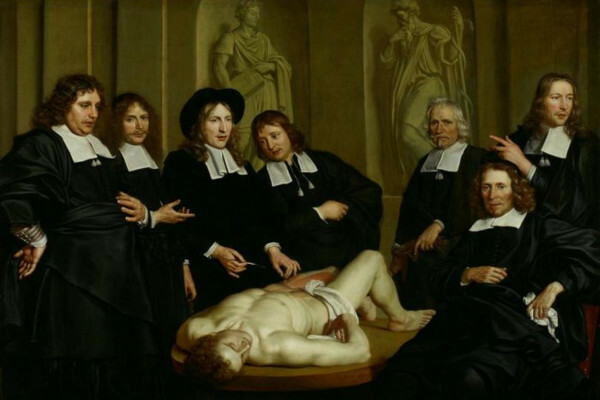 But increasingly, medical schools are abandoning the dissection approach to teaching anatomy. So, I went along to one place that still does it this way - that's Cambridge University - to find out what their students think of the process. Chris - There are over 600 different muscles, 428 named nerves, and 206 bones in the average adult human, and a medical student needs to know the names of all of them. Theo - We've got a nice prosection here of the side of the face with the skin removed and some of the muscles, and now, you can see a gland here. You know what that is? Theo - Good and coming out of the front of the parotid are a number of little structures. Do you know what they are? Theo - The facial nerve, yes. Now do you know any of the branches of the facial nerve? Chris - But building up a mental picture of how all these different structures in the body fit together and in three dimensions is very difficult. Traditionally, trainee doctors have done it by dissection, cutting up human bodies usually under the trained eye of an expert anatomist like Theo Welch whom we've just heard. So, what do present day students make of the process..? Abigail - I'm Abigail Lucas from Gonville and Caius College, Cambridge, first year medical student. I think it's really good because you can actually put it into perspective. I look in the textbooks, but it's not the same as actually seeing it. It'd be really difficult to do it and get it properly with just textbooks. It's really beneficial to actually to get to see it and then you can actually visualise much better in 3D. Lahiru - My name is Lahiru [Handunnepthi] and I'm from Hughes Hall. What do I think of dissections? I think it's fantastic. It's a really good way to learn anatomy. I mean, you get to see the structures that you don't normally see in textbooks. Chris - And what's the general opinion, people think this it's positive? Abigail - Yeah, I think they do. Chris - Medical students at universities elsewhere in the UK, do they get the same learning experience? Abigail - I think most of them don't. I think there's only a few places that still do. I know one of my friends - she's at Keele - they just used plastic models. We did that the other week and it was a lot more difficult to figure out where things were when you can't actually sort of move them and see where they attach properly. Chris - So the opportunity to do proper dissection seems to be really key to learning anatomy effectively which is a sentiment that's echoed even by surgeons in training too, including this one who's brushing up his knowledge of the subject by teaching it. George - My name is George Marsden. I completed my foundation year here as a junior doctor in 2009 and I'm currently teaching anatomy for a year at Cambridge University as a junior anatomy demonstrator, and we also do on-call shifts at the Addenbrooke's Hospital in general surgery. Chris - So, the idea is that for someone like yourself, because you've got to take higher exams in surgery as a would-be surgeon, doing something like this is a really good way to learn the anatomy. George - Absolutely. Unfortunately, the university where I trained, we weren't able to do dissection and I really felt I missed out on anatomy which has always interested me, and I realised I wanted to pursue a surgical career path, and thought that teaching anatomy would be the best way of learning it for myself and almost give me a second chance to make up for last time. Chris - So why are medical schools increasingly ditching dissection if it's so useful? And is Cambridge unusual in still teaching its anatomy this way? Chris C. - My name is Chris Constant. I'm a clinical anatomist here in the Human Anatomy Centre at the Department of Physiology Development and Neuroscience. Cambridge University is a bit unusual in persisting with whole body dissection as our method of teaching anatomy. We believe it is the best way by far to teach anatomy to our students, so that when they go into practicing medicine, it will mean something to them. Chris - Why if it's so important, have so many medical schools stopped doing it? Chris C. - A number of reasons; cost is one, the effort it takes to run a body donation programme, ethical and legal issues, the difficult issues of respect, and basically the organisation of such a programme is actually very costly, very time consuming and very demanding in every way, and many universities have found alternative methods, things like plastinates, and models, and prosections, and atlases. And of course, to new electronic resources such as videos and electronic media which do have a lot to offer. Chris - So students at Cambridge are very lucky to still be able to do whole body dissections. But one of my own most enduring memories of the first month of medical school was a nagging apprehension at the back of my mind about what it was actually going to be like to cut up a dead person. And talking to the students I met during my visit to the Cambridge dissection room, this seems to be quite a common experience. Rowan - I'm Rowan DeSouza. I'm a first year medical student at Clare College, Cambridge. Chris - When you were coming to medical school, were you at all concerned about the process of having to come and do dissections on dead people? Rowan - Yeah. I mean, I think everyone is concerned. It's obviously something very, very different because it's human beings, it's very personal, but I kind of saw it as a benefit. And I think most people did because the Cambridge course is one of the best for anatomy because it does dissection. I mean, the first few sessions, they took us in very gently. They kind of covered up all the bodies, they kind of introduced us very slowly, and eventually, everyone gets used to it, and anatomy is fascinating, so it's very interesting. And once you're into the course, it's really good fun. Chris - Were you worried? Claire - Yeah and I still catch myself thinking this was a real human who was walking around and doing every day, normal activities and things, but I think you'll get used to it, and it's a really good way to learn. Chris - Claire Blackman who's a medical student at Cambridge. So, if someone wants to donate their body for medical education, what should they do? Chris Constant again. Chris C. - They need to make that clear by signing the appropriate Human Tissue Authority consent form which specifies what they wanted to be used for, how long we may keep their remains, how the material will be disposed off at the end; they need to inform their families. Their families need to agree, although that's not absolutely necessary, but we do like it if they're all in agreement, and of course, they need to keep the necessary paperwork available, so when the time comes, it is actually there and relevant, and ready to be used. Chris - Can anybody leave their body or are there certain situations where you wouldn't accept a donation? Chris C. - Anyone can donate their body after death. However, when the time comes, we have certain criteria with which we have to comply and there are certain criteria which result in our having to reject someone's remains. The donors are aware of that when they signed a consent form that there is a possibility that their remains would not be accepted. Chris - And once the students have finished doing the dissections here, what do you do with the pieces they've dissected and then the body en masse? Chris C. - To begin with, all the parts remain together for each individual donor's remains. They are not mixed so that they are all returned to one particular coffin and then cremated or buried in accordance with the donor's wishes. Prior to that, we have a committal service here in the anatomy centre in the dissecting room, at which students and others involved in dissection attend. The identities of the donors become known to these students. They have a chance to pay their last respects and indeed write a tribute to each of the donors, upon whom they have worked over the previous academic year. And it's actually quite a moving event. By the time we're finished with the remains, they are respectfully buried or cremated in accordance with the wishes of the donor, and everyone has their own remains. There's no mixing of parts. Chris - And what would you say to anyone who's considering leaving their body for a medical student to learn on like this? Chris C. - Well I would be very encouraging. First of all, it's an extremely generous act. It is something one can feel very good about. It benefits the students and ultimately, the doctors that are made from the students, and therefore, the patients in years to come. So what the donors are doing now in their life time, to be carried out on their death will benefit generations to come. I would be very positive. I think it's a great thing to do and I think you can feel you've benefited people after the good you do in life has finally come to an end.